Keeping the barn at the right temperature and humidity level is very important for the comfort and performance of our birds. Often I hear questions from customers on the best method for ventilating the barn in the summer season. There are number of other factors to keep in mind when dealing with high heat and humidity including feeding strategies, diet, and stocking density, but perhaps the most important is ventilation. The use of wind chill and cooling systems are two effective methods of improving ventilation. Using air speed, such as tunnel ventilation, is a very good method of cooling down your birds as it helps remove heat from the building and from animals. But, you may be asking, how do I calculate the right velocity? 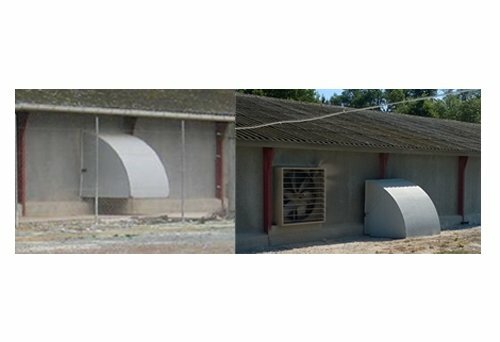 The air velocity in the poultry house depends on the power of the exhaust fans and the cross sectional area of the building. This formula allows us to calculate the number of fans needed to obtain the desired air velocity. It is most often run between 2 to 3 m/sec (400 to 600 ft/min). It is recommended to increase the air speed if the following elements are in play: a higher temperature, a higher humidity, older birds, larger animals, a higher stocking density, or wet litter. One thing to keep in mind is that the efficiency of the exhaust fans, and therefore the air velocity, depends on the static pressure in the building. Static pressure, or a tight house requires proper use of air inlets. Air velocity can be reduced by several other factors such as Pad-Cooling cells, age of the fans, poor fan maintenance or obstacles such as light shutters upstream and downstream from the fans. In an open building with curtains, it is easy, inexpensive and fairly efficient to add circulation fans in order to create a strong air flow on the birds. A good rule is to place one 40 000 m3/h fan every 200 m² of building surface. Cooling systems such as Pad-cooling and high pressure fogging are very effective at cooling the environment and reducing humidity. High pressure fogging systems are slightly less efficient than Pad-Cooling, but it is an easier system to install, especially in existing buildings, and easier to maintain. If in doubt, a good rule of thumb is that wind chill can be used to cool the environment at about 24°C (75°F), or more precisely, before the animals begin to pant and then, in a second stage, Pad-Cooling or fogging can be used at 30°C (87°F).